For the uninitiated, VandalEyes refers to the act of adorning everyday objects with those little plastic googly eyes you find in craft stores. The practice first came to my attention in early 2012 when Bonnie, along with Kiala Kazebee, Veronica Belmont, and Felicia Day, began the Vaginal Fantasy Book Club. As a consequence of those Hangouts, I started following Bonnie’s Twitter feed, and later found Anne’s account and the #VandalEyes hashtag. The random nonsense there eventually spawned its own website, vandaleyes.net, to which I may have submitted a few pictures. When Anne Wheaton and Bonnie Burton posed for Cupcake Quarterly Magazine in May of 2013, they made the mistake of posting pictures of themselves in retro hairstyles on their Twitter accounts. 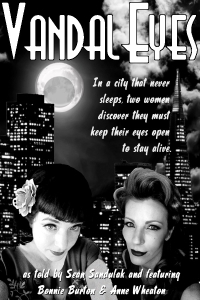 I immediately photoshopped those pictures to look like a noir book cover and sent it in to the VandalEyes tumblr. Later, when I looked at that picture again, I thought that it ought to have a story to go with it. This is that story. You’ve seen them everywhere. Those little plastic googly eyes that turn everyday objects into adorable faces. Maybe you’ve seen them stuck to a poster, turning a regular photograph into an amusing parody of itself, but all this time, I bet you never suspected the sinister history of this simple folk art stable. Now the true story can be told. It’s a tale of friendship, crafting supplies…and murder.